In memory of the victims of last week’s violent shooting in Aurora, Colorado, stand united with our friends and neighbors in Colorado by flying the Colorado state flag. 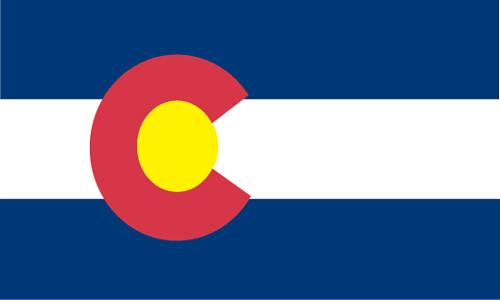 The flag of the state of Colorado was adopted on June 5, 1911. The flag is rectangular with three horizontal stripes. The top and bottom stripes are blue and the middle stripe is white. Just to the left of the flag’s center point is a block letter red “C” that is filled with a gold circle. Andrew Carlisle Johnson designed Colorado’s state flag during the year of the flag’s adoption. Previously, the flag of Colorado featured the state seal on a blue background. When the flag was originally adopted, the block letter C with the gold circle was smaller, and the entire graphic fit inside the white stripe. In 1964, the specifications for the flag were changed and the diameter of the gold disc is as large as the white center stripe. The details of the Colorado state flag hold significance for the residents of this state. The blue stripes symbolize the big, clear blue skies of Colorado. The white stripe represents snow on the mountaintops of Colorado, some of which lasts all year round. The gold disc symbolizes the Colorado sunshine and the red C represents the color of some of Colorado’s soil. The flag of Hawaii was adopted on December 29, 1945. The flag is somewhat of a combination of the British flag and the flag of the United States of America. The flag is rectangular and has eight horizontal stripes that alternate in red, white, and blue colors. The Union Flag of the United Kingdom appears in the upper left corner of the flag. The flag of Hawaii is unique in that it is the only state flag in the United States to feature the Union Flag in its design. Although the flag’s design is simple, the horizontal stripes are symbolic to the state of Hawaii. Each of the eight stripes symbolize one of Hawaii’s major islands: Hawai’I, O’ahu, Kaua’I, Kaho’olawe, Lana’i, Maui, Moloka’I, and Ni’ihau. The order of the stripes is white, red, blue, white, red, blue, white red, and these colors were standardized in 1843. The Union Flag acknowledges the British Empire’s influence on the state. Although the flag was not adopted until 1945, the flag’s origins date back to the early 1800s when Hawaii was ruled by King Kamehameha I. According to one story, the King flew a British flag—the Red Ensign with the Union emblem in the upper left corner and a red background—that was the British explorer George Vancouver gave him as a symbol of friendship with King George III. When Kamehameha’s advisor told him that the Union flag could bring Hawaii into foreign conflicts, he stopped displaying the flag, and in 1816, commissioned his own flag. The 1816 flag of Hawaii, most likely designed by one of the Hawaiian Navy commanders, evolved into the current Hawaiian flag. The flag’s design is based on the British East India Company’s flag, which features the Union flag in the upper left corner with red and white horizontal stripes.